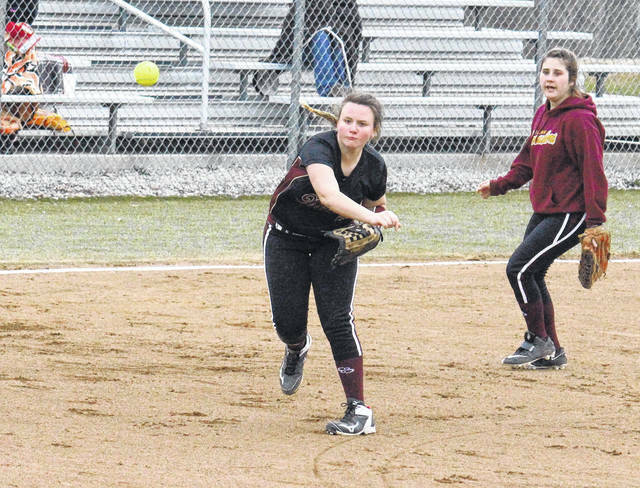 Meigs freshman Chonslyn Spaun throws to first base in front of teammate Jerrica Smith, during the Lady Marauders’ 6-5 win on Monday in Rocksprings, Ohio. ROCKSPRINGS, Ohio — A flare for the dramatic. 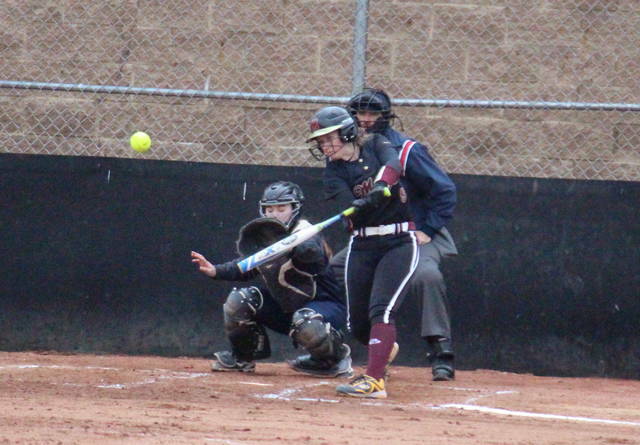 The Meigs softball team picked up its second straight walk-off victory in Tri-Valley Conference Ohio Division play on Monday night in Meigs County, this time defeating Wellston by a 6-5 count in eight innings. Meigs (4-1, 2-0 TVC Ohio) took a 2-0 lead with one out in the bottom of the first inning, as Chonslyn Spaun singled home Taylor Swartz and Ciera Older. However, the Lady Marauders left two runners in scoring position at the end of the inning. The Maroon and Gold added on in the bottom of the second, as Swartz scored on a two-out triple from Breanna Zirkle. Wellston got on the board in the top of the third, with back-to-back RBI singles cutting the Lady Marauder lead to 3-2. 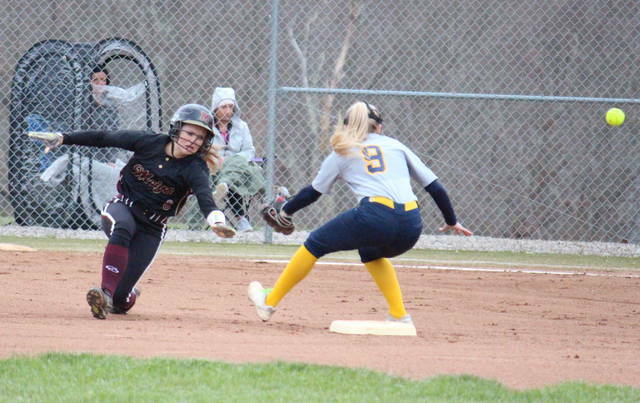 Meigs was scoreless in the third inning, but stretched its lead to 4-2 with two outs in the bottom of the fourth, when Peyton Rowe singled home courtesy runner Bailey Tracey. The Lady Rockets evened the game in the top of the fifth, as Kendra Coleman singled home Erica Scott and Ashley Compston. Two batters later, the Mya Bouska doubled home Coleman to give Wellston its first lead, at 5-4. The Blue and Gold only reached base one more time in the game, however. Meigs tied the game with two outs in the bottom of the fifth, as Karington Brinker doubled home Jerrica Smith. Following a 1-2-3 sixth, the Lady Marauders put runners on the corners in the bottom of the seventh, but ultimately came up empty, forcing extra innings. After retiring the Lady Rockets in order in the top of the eighth, Meigs began the bottom of the frame with Swartz drawing a walk. After a pair of outs and another walk, Spaun singled to right field, bringing Swartz in to score from second and giving the Lady Marauders a 6-5 win. Zirkle was the winning pitcher of record for Meigs, striking out one and allowing five runs, four earned, on nine hits and one walk in a complete game. Compston suffered the loss in a complete game for Wellston, striking out nine batters, while allowing six runs, five earned, on 11 hits and six walks. Spaun led the Lady Marauders at the plate, going 4-for-5 with three runs batted in. Alyssa Smith singled twice for MHS, Zirkle tripled once and drove in a run, while Brinker contributed a double and an RBI. Swartz singled once and scored three times, Jerrica Smith singled once and scored once, while Peyton Rowe had a single and an RBI. Older and Tracey scored a run apiece for the victors, while Swartz had a game-high two stolen bases. Leading the Lady Rockets, Compston was 2-for-3 with one double, one run scored and one RBI, while Coleman was 2-for-4 with one run scored and three RBIs. 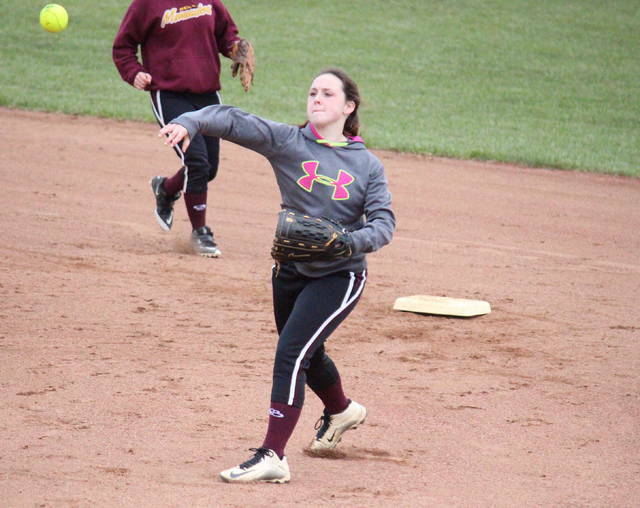 The Lady Marauders committed two errors and left 10 runners on base, while Wellston had three errors and six runners stranded. The Lady Marauders will go for the sweep of the Lady Rockets on April 23 at WHS. After hosting Marietta on Tuesday, Meigs will be back on its home diamond Thursday against Athens.